Today is Scott’s birthday. His parents and my dad and my brother are here. Sam’s graduation is in 4 days. So many thoughts and emotions today. Another first. If I’m not careful I can find myself stressed about wanting to do this right and missing just being right where I am, right where we are together. Traditions feel like a necessary lifeline for Josh and Sam and I as we move forward. What kinds of things are meaningful? What is sustainable when we will mostly likely be apart for so many of the milestone days in the future? For today we had tacos and razzleberry pie. 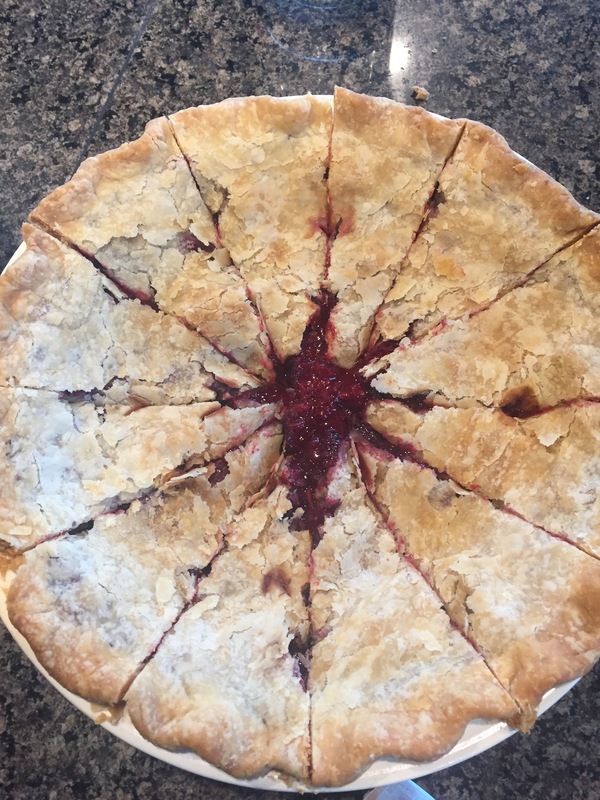 The only thing I took a picture of was the pie and that was after I’d started to cut it. I guess I was doing a good job being in the moment instead of behind the camera. It seemed like we should go around and share memories of Scott or something we learned or appreciated. But it felt too forced. So I let it go. These thoughts don’t end up being about Scott at all, but about us without him, so grateful we knew him; that he loved us and we loved him. Knowing that the pain is hard but I wouldn’t trade it if it meant I’d never done life with him. What a gift to miss him. And at the end of the day, here I am. We did it. So I’ll put my head on my pillow and rest with memories and smiles and tears, looking back and looking ahead all running together as they sometimes do. Prayers for you today, dear Julie, and an extra large dose of God’s grace and comfort. May you and the boys find moments when it doesn’t feel forced, but just right to share some of those lovely, sweet memories. Thank you, Debi. We do share memories often. I am thankful. Three thoughts I have for you, on this hard Birthday. You’re beautiful, your razzleberry pie looks perfect in peices, & I’m so glad to know you before and after. Hugs and Payers.